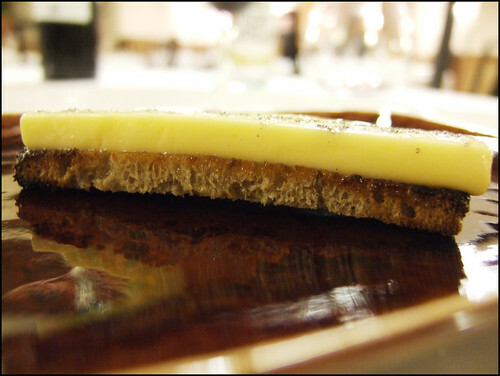 “Etxebarri” – it’s spoken on the lips of the fooderati as if it’s an impossible perfection. Etxebarri is tucked in the rolling hills of Axpe, Spain inside a two-story stone building on a village square. The restaurant has been mythologized in blog posts and magazine articles – a man, exemplary seafood, his home-made grills and charcoal, and a grill technique from the next realm. 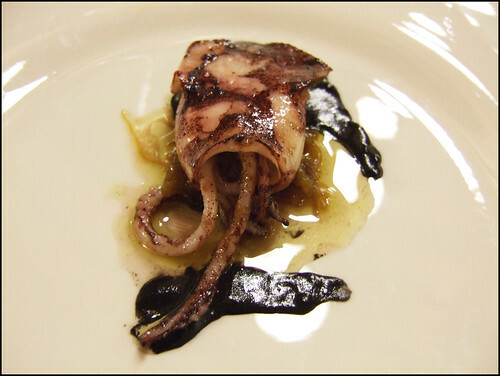 It’s a romantic story, a Basque Howard Roark, cooking his food without regard for international trends. It has become the ultimate experience in foodie currency. 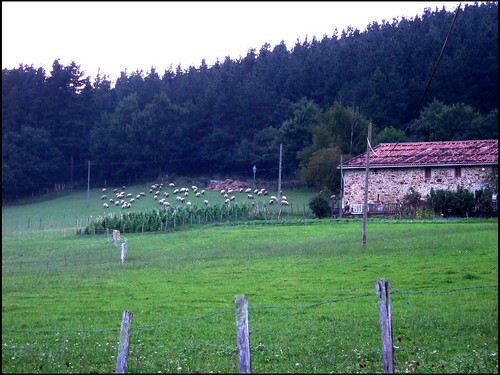 Everyone has been to Roses by now but how many have trekked their way from Bilbao, or San Sebastian, to the bucolic village of Axpe? This is the sort of place that piques my interest in all of the right areas. It has a vision, un-adultered by any concern for markets, and it has an identity tightly coupled with its region. I expected a statement as powerful and transcendental as Urasawa, the closest ideal I could find in the culinary pantheon. These expectations, as we’ll see, played a significant role in decoding this meal. Chef Victor Arguinzoniz begins with the freshest ingredients possible for the day. 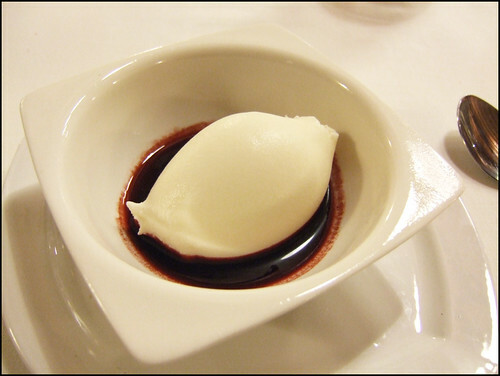 The Etxebarri web site lists different seasons for what have become luxurious and highly sought after ingredients. The nearby mountain, the site says, provides a stomping ground for the chickens, plots for the gardens, and even a well for the water. The seafood quality on this trip was uniformly excellent, with a few examples being reference-worthy. Chef Arguinzoniz then applies his own brand of culinary technique to the offerings. Rumored to be among the world’s greatest grillers, he takes his art very seriously. Where else would you find a restaurant that produces its own charcoal, different varieties depending on the dishes to be served. Where else would you find a chef who has created his own grill? Obsessiveness – it does indeed help create legends. 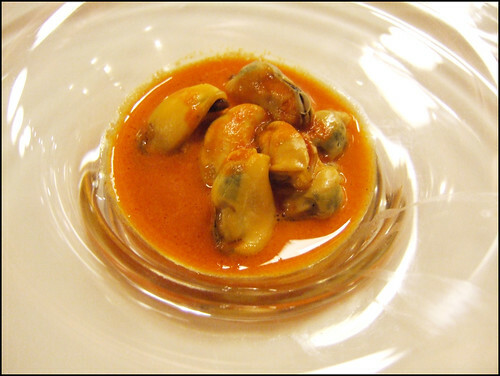 Notoriously, Michelin has not ranked Etxebarri. It will be interesting to see if that changes with the next edition considering the fanfare the restaurant has been receiving. The food has been universally praised but not much has been said about the facilities. Where I expected a serviceable room, the room had a refined and rustic touch more than becoming to a Michelin one or two star restaurant. It sets the mood nicely for the meal to come. Very moist, tasty, and full of subtle flavor. 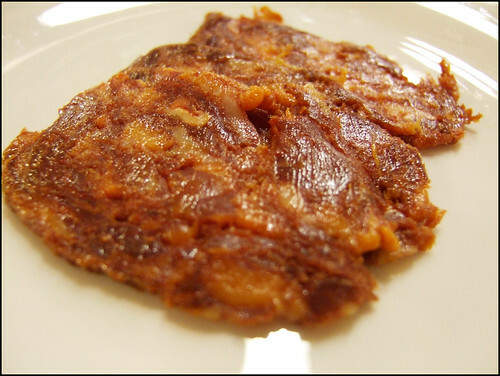 It is said to be made from iberico pig with meat and fat from the same cuts. Very Good. This home-made butter couldn’t reach the heights of the legendary Bordier but it laid the gauntlet down – this charcoal and grill business can reach sublime heights. The butter was quite creamy but the light smokiness, courtesy of the tiny flakes of smoked salt, elevated this dish to a meditative experience. Excellent. This had an excellent subtle iodine flavor but it was marred by an overcooked section of the tail, closest to the body. Many joke that I would gladly eat on the plains with the lions, but even slightly overcooking a langostine is a costly mistake. Ok. Intensely sweet, cooked perfectly, but it lacked the necessary salt to brighten the meat. The lack of salt was a theme with this meal. This dish also made me wonder if the simple prawn, as good as they are, is even better with subtle spices ala Manresa. Good. Quite sweet, plump, lightly grilled, unlike any oyster I’ve had, with a light smokiness throughout. 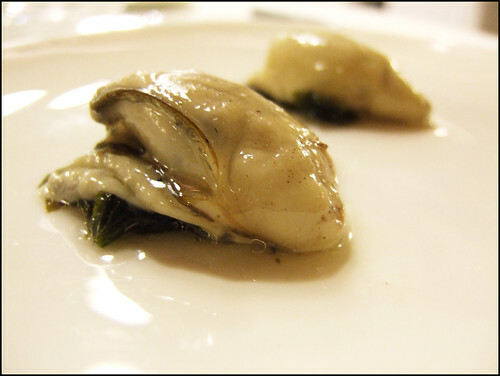 Some reports say the oyster is sprayed with olive oil, others the oyster juices. Regardless, reference material for cooked oysters. The seaweed, slightly smoky itself, provided perfect texture counterpoint. Excellent. 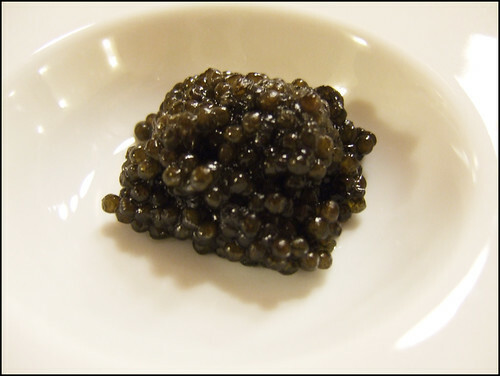 Most reports suggest this is Iranian caviar but I wasn’t paying attention. The slight cooking seemed to rob the caviar of its intensity although the smoking was an interesting effect. Ok.
A perfect, and I don’t use that word lightly, char that was subtle enough to impart a taste but not dominate it. 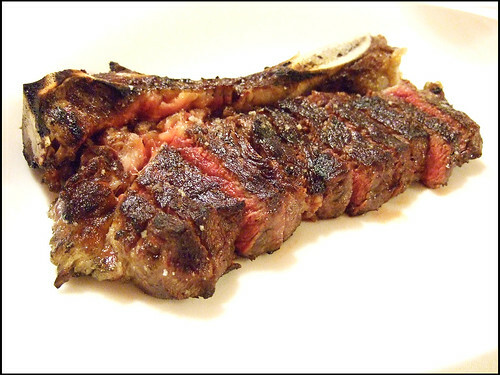 This dish fulfilled every expectation I had for Etxebarri and his prowess with a grill. Easily, the dish of the night. Excellent. Unlike any mussel I’ve had, nearly as plump as the oyster, with a fair amount of spiciness from the soup. Again, a reference for future mussels. Very Good. Grilled nicely but it terribly lacked salt. Good. The perfect char from the sea cucumber was missing; this seemed nearly lazy in comparison. The dish also suffered from a lack of salt. Good. Beautiful piece of fish. The fish was barely cooked, just enough to be warmed throughout. Each section, as you can see in the photo below, was salty and slightly gelatinous. Very Good. Not much upfront taste but a much stronger aftertaste when compared to American beef, with a light smokiness carrying it. You could say the flavor was gamey. Made of retired Galician cows more than 8 years old (whereas the typical American cow is generally less than 2 years old.) Very Good. Perfect ice cream. Unsure of which sort of milk, sheep’s being my guess, the texture and richness was unparalleled. Others have reported that the ice creams are smoked, but I don’t recall any smokiness in the flavor. Excellent. In the end, it was a meal of mixed emotions. You could see the purported brilliance, nearly taste it in every dish, but it just fell short. 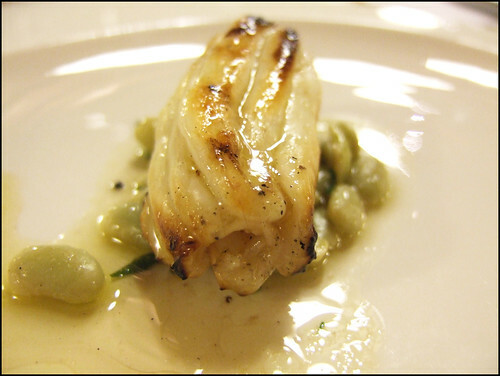 From a grilling perspective, only the sea cucumber and oyster fulfilled the promise of their mastery. The smoked salt butter was also exemplary for its smokiness. But, unfairly or not, I expected more dishes to be a revelation. But why does this meal stick in my mind? 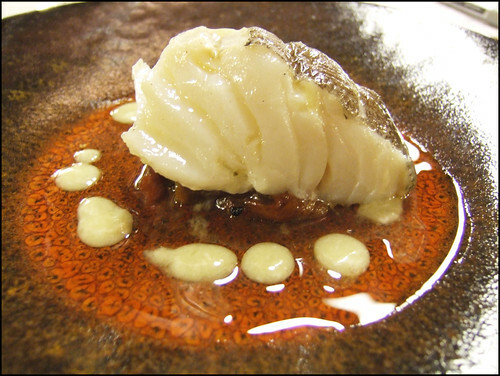 In a normal restaurant, even of three-star levels, one is usually ecstatic to get one or two memorable dishes. And yet, Etxebarri, this modest farmhouse, produced four or five reference dishes – dishes I’ll use as a yardstick to measure others. When I discount the misses, and focus on the hits, the meal advances in the memory. Would I recommend it on a trip to Spain? Yes, for the truly obsessed. It is too expensive for someone with just a casual interest. Would I include it in a list of the world’s best restaurants? Not yet. 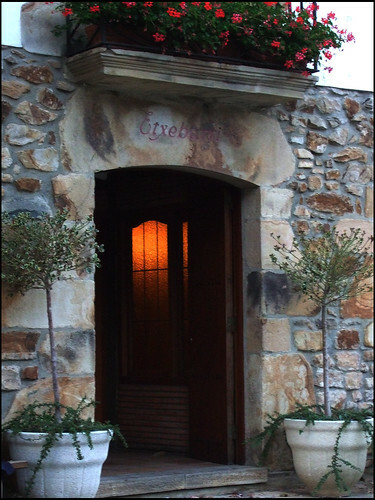 Will I re-visit on my next trip to Spain (or Southwest France)? Yes. Do I expect it to make it into my top 10? Yes. I have been looking forward to this review for some time. I am sorry that it did not meet your expectations! I would love more information about each dish. Is that grilled bread under the butter? What are those beans under the Sea Cucumber? What kind are the mushrooms? What is under the Squid, and under the Ice Cream? Do you feel that the lack of salt was intentional, (have you heard others that have said the same), or was it an off night? Thank you for the web page, I always look forward to living vicariously through it. Stephen, you got most of them correct – grilled bread (toast), buttery beans (unknown variety) that melted, a variety of mushrooms, and i’ve long forgotten what was under the squid. Same goes for the ice cream – the ice cream was too good to taint it w/ anything. 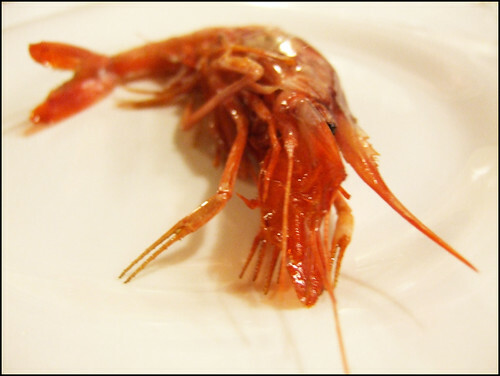 Pristine seafood is Spain is quite expensive b/c of ingredient cost. Langostines routinely run 70-100 euros for one. This meal cost 175 euros/person total. the cost of the langostines and the beluga (you didn’t specify but in past reports it has been indicated) easily justify a 175E price, perhaps even make it a good value. 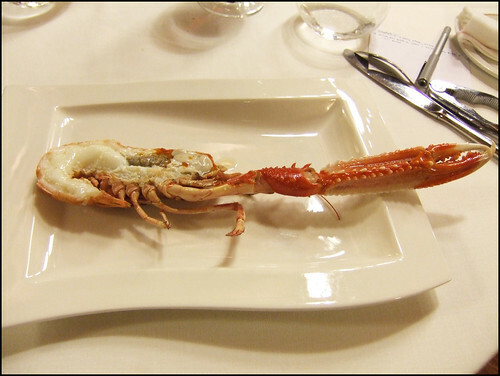 any thoughts on how the thickest part of the langostine was the most cooked? sauce under the ice cream looks good. do you know what it was? 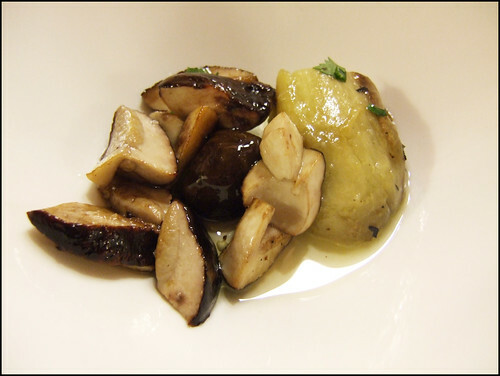 i think it is great that with every new report there are new dishes or ingredients to be explored. the mussels look wonderful. Sam, not complaining about the price as it’s inline w/ the ingredients. Depending on how obsessive people are about these things, they may or may not feel ripped off. No idea on the langostine – does seem odd. I agree w/ you about the menu. Everyone has a slightly different menu but it may be a function of dining at different times of the year. I appreciate that their web site details the specials for each season – makes it a lot easier to plan trips around. The location looks amazing. Sorry to hear the food didn’t quite measure up. Not such a great menu for a vegetarian like me, but there are a few dishes I’d have loved to try. 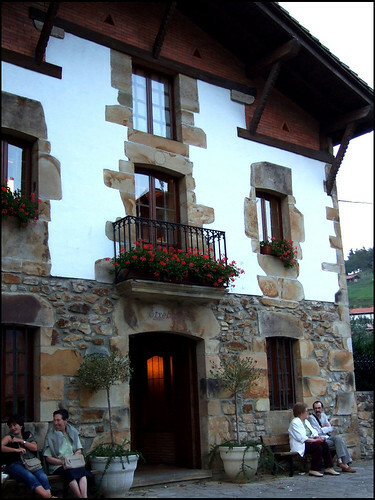 I did trek my way from san sebastian to Axpe to eat in july 2007. The food was really good but compaired to our other experiences in zuberoa, akelare, mugaritz and julian de tolosa this was least memorable by far. Maybe it had to do with expectations, a hyped up restaurant in a remote place and beautiful place with a chef that makes his own grill, who wouldnt like to love such a place? The settings were truly beautiful, the interior of the restaurant did not pay tribute to the sorroundings. Good place to eat – but go for a lunch and see the beautiful sorrounding and have a dinner somewhere else. You summed up the experiences very well here. The concept, the perfection of the grill, warrants a visit in and of itself, but there is something more needed to be a great restaurant. I wouldn’t put this one in my top ten list. I beg to differ. This was one of the most memorable meals I have ever enjoyed. I planned a 28-day trip from Monaco to Paris simply to include this restuarant. The food was equisite, the service friendly, thanks to the resident Aussie, and the ambiance wondeful. I’m planning a return trip next year and I’d definitely include this on my list of top ten. (And I am planning to eat my way through Gourmet’s List). BTW, thanks for the wonderful photographs. Perhaps the blogger’s taste buds have deteriorated with age, but when we ate there last year, the smokiness was most definitely detectable in every dish, including the ice cream! This was the most memorable meal we have ever had. The plain, rustic setting, the presentation, the flavors (plenty salty for us! ), and the kind and helpful staff all contributed to a “wow” experience. We also happened to be there ont he same day as a sheep herding exhibition across the road, which was spectacular! Just don’t stay at the hotel on the hill. The beds were awful! We were disappointed that nothing was included in the 120€ tasting menu – not VAT (iva) wine or coffee or anything… we made all the effort to get there and paid heavily for it!